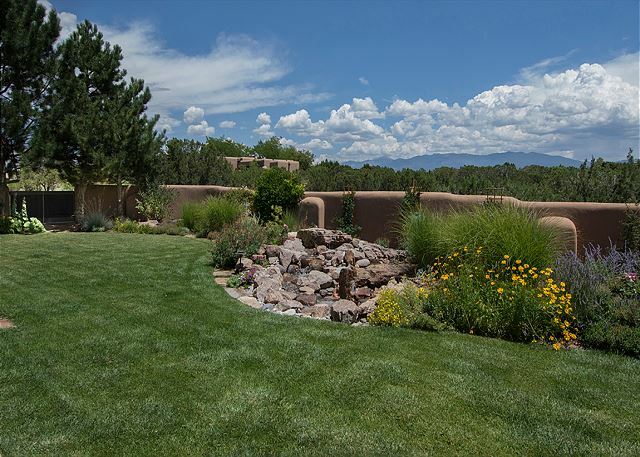 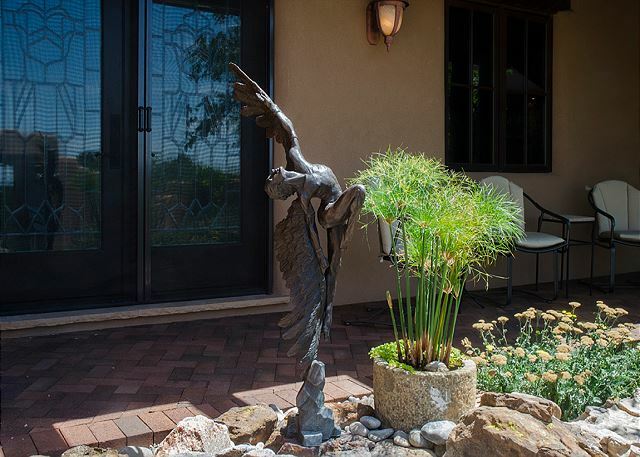 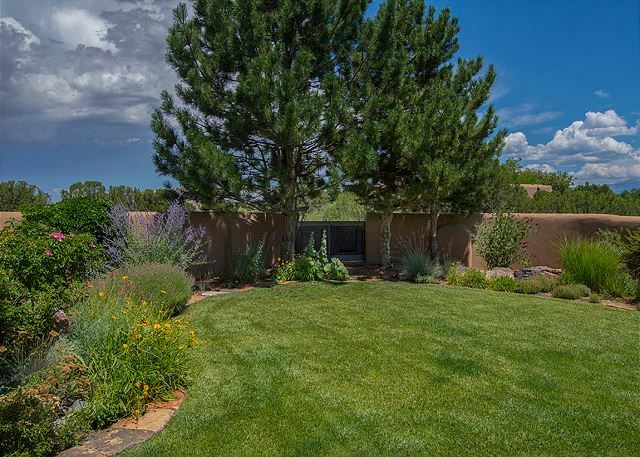 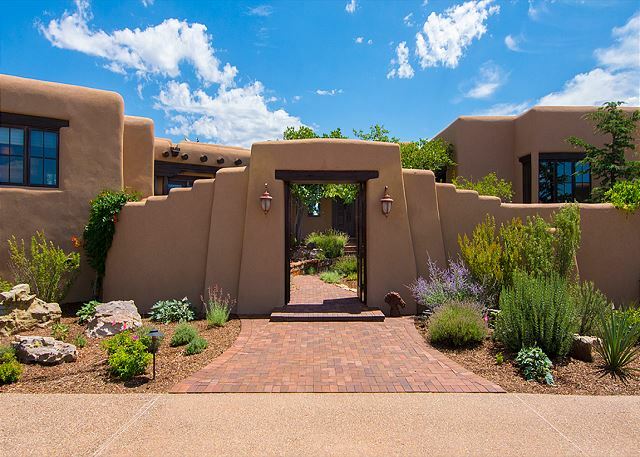 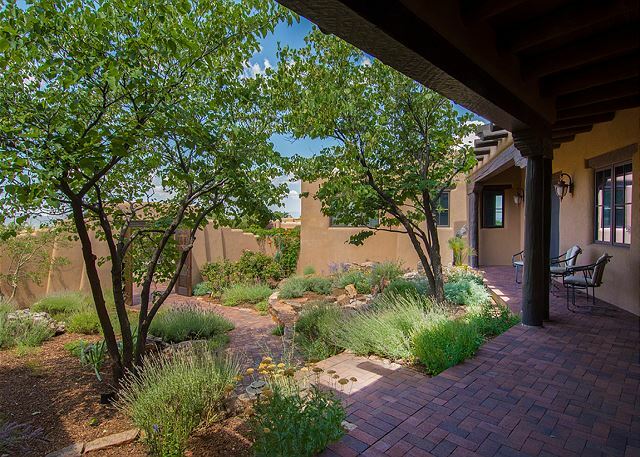 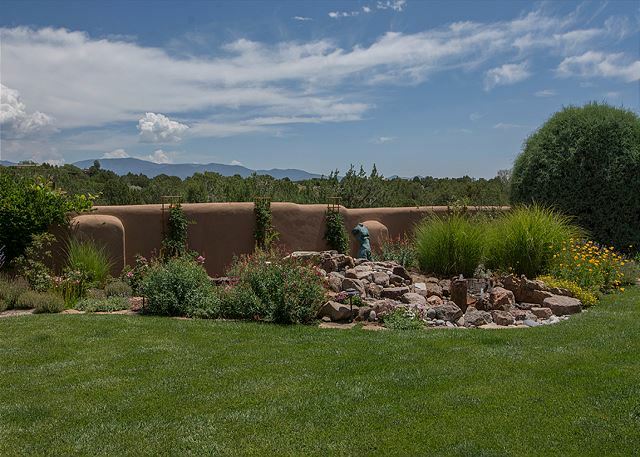 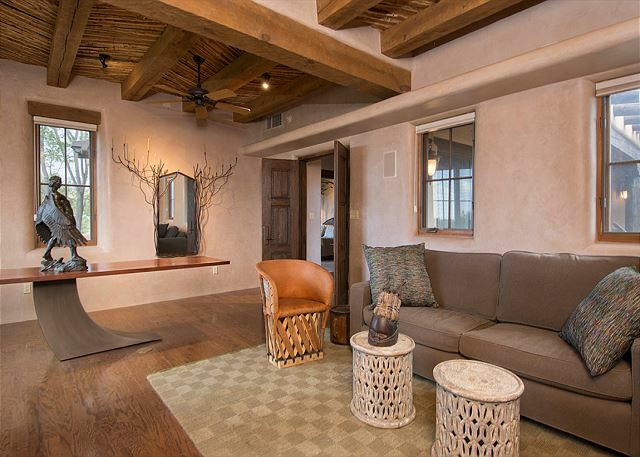 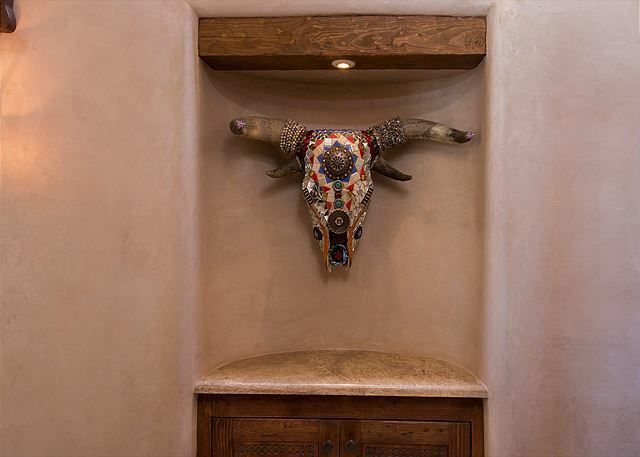 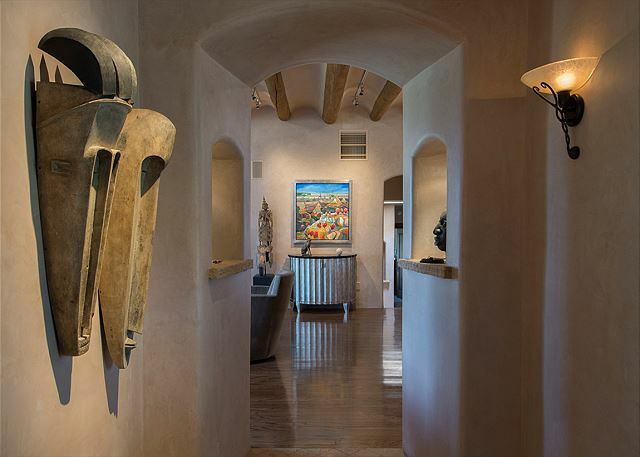 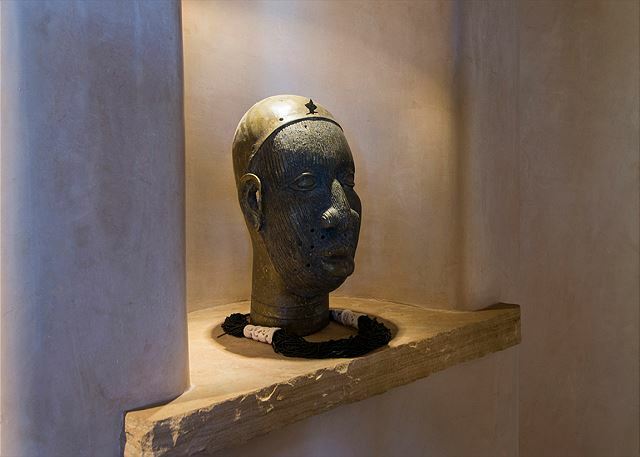 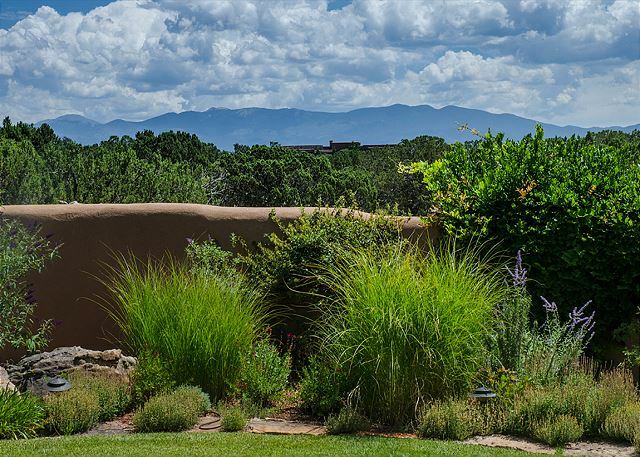 8 Painted Horse is a relaxing atmosphere and an excellent flow of space adorned with custom furniture, interesting art, bright and welcoming sweeping views of the Sangre de Cristo, Jemez, Ortiz, and Sandia mountain ranges. 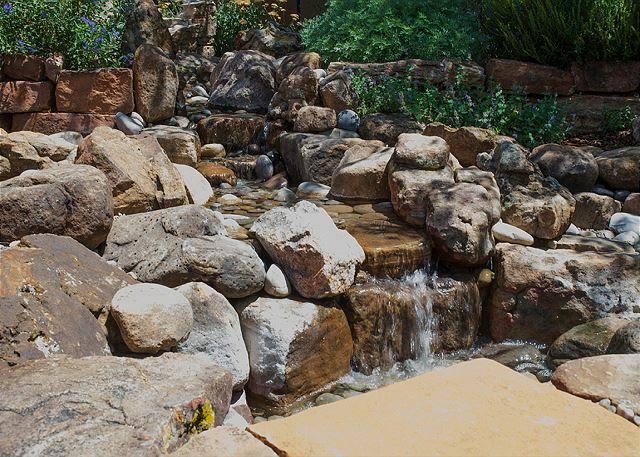 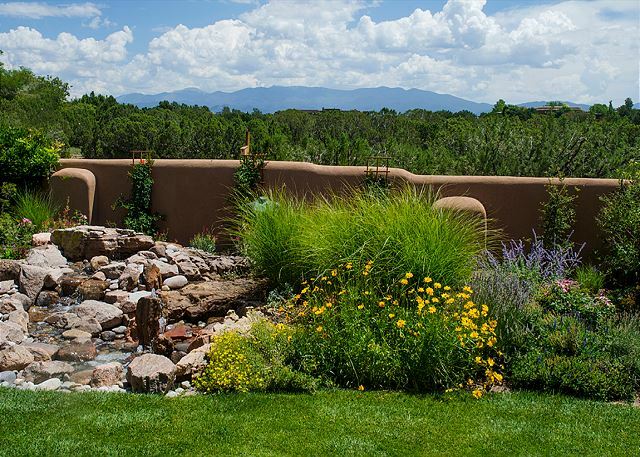 As you enter the lush front garden there is a large custom water feature to your left. 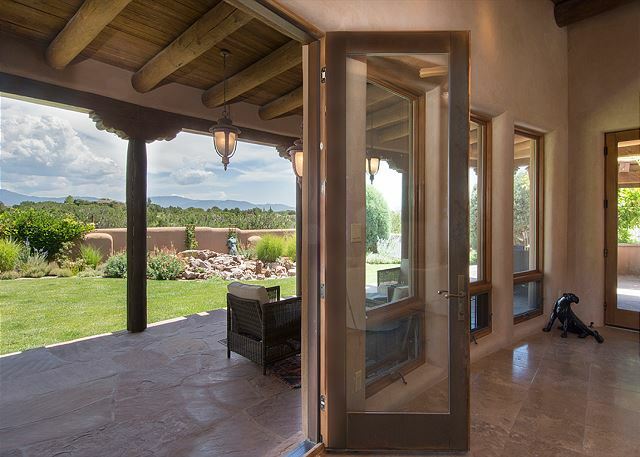 Up a couple of steps the huge double doors open to a living area that carries your eye to the rear garden and stunning Sangre views. 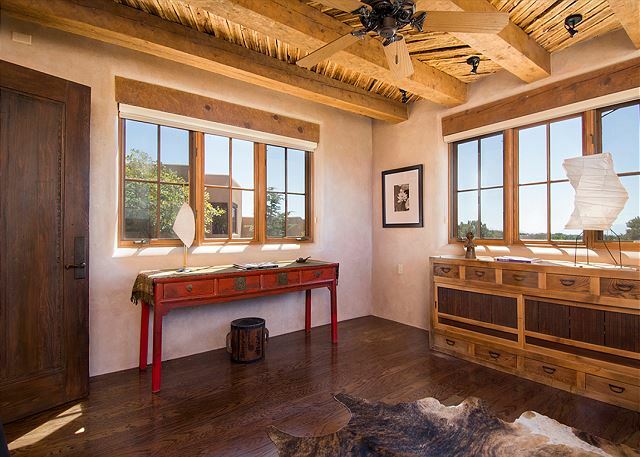 Once inside note the ceiling treatments, especially lit skylights, and savor how every door in this exceptional home is hand carved. 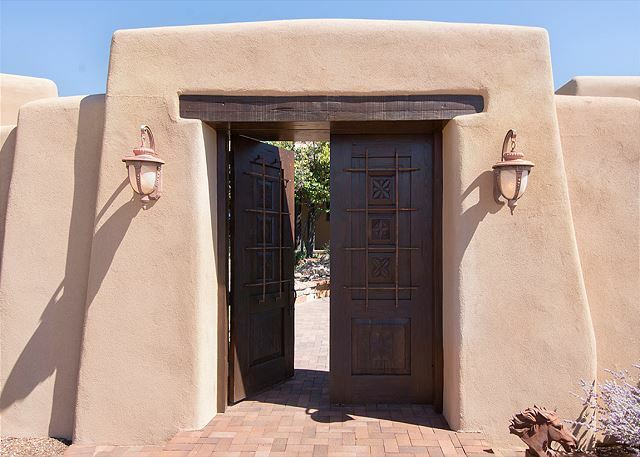 The rear portal offers a cozy fireplace, comfortable furniture, and an outdoor kitchen. 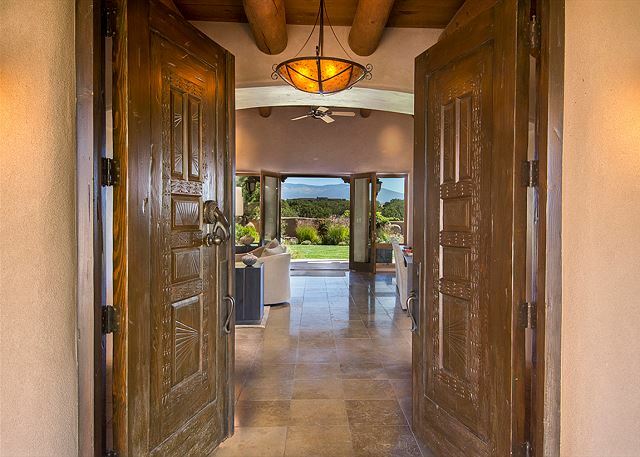 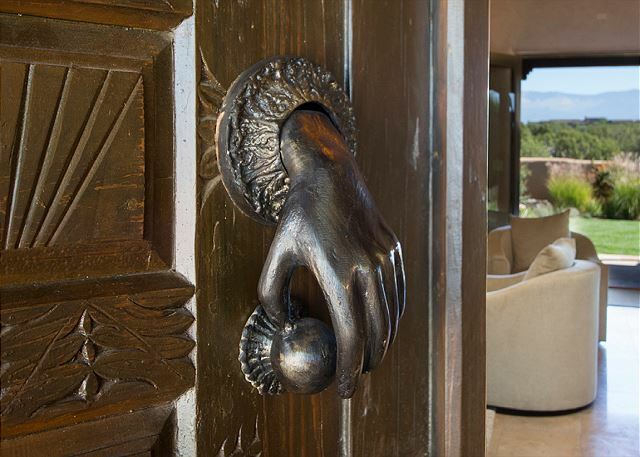 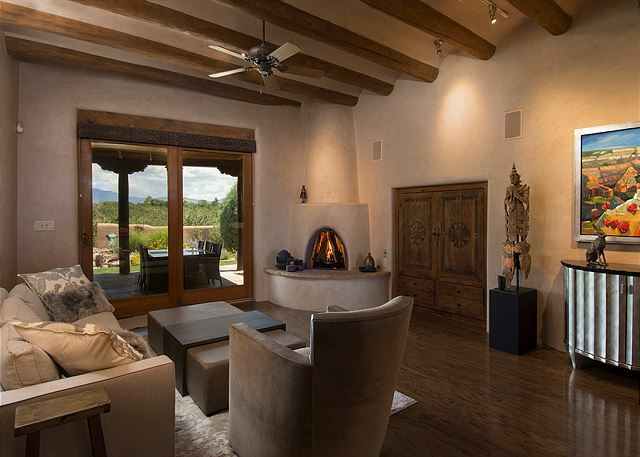 This superb home has custom finishes throughout, blending Spanish with modern design sensibilities. 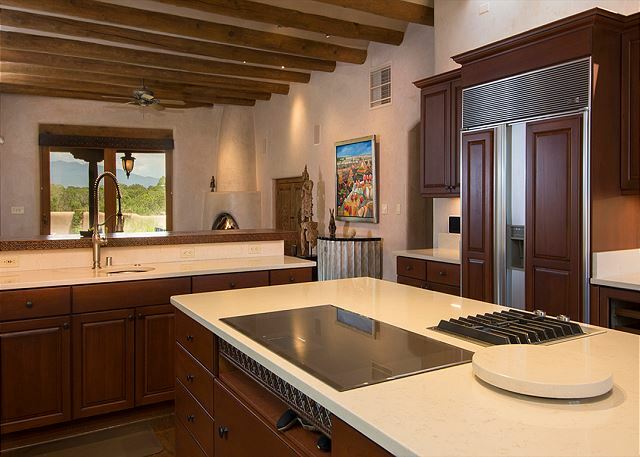 A true chef’s kitchen that has been freshly updated with both induction and gas cooktops, 2 dishwashers, new surfaces, lighting, and a cozy breakfast nook with a custom table by Taos artist, Chad Manley. 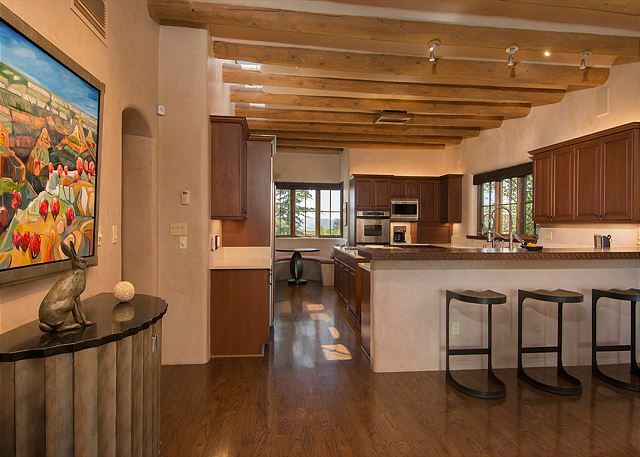 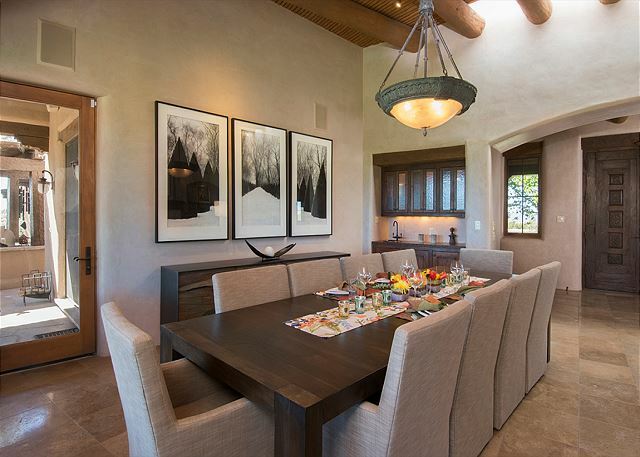 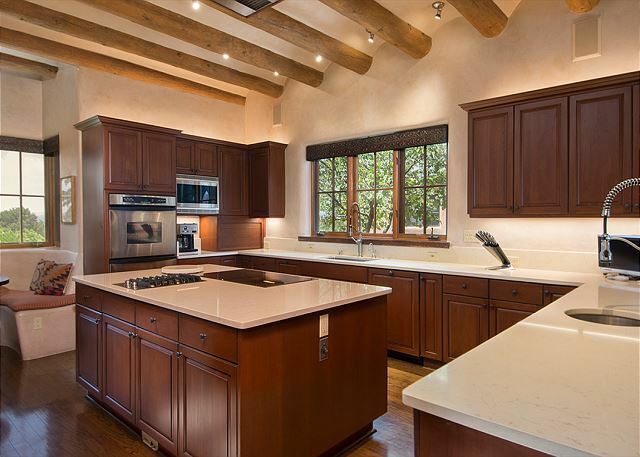 The kitchen opens to a large family room with easy access to the fully equipped outdoor kitchen rear gardens and commanding views to the Sangre Mountains. 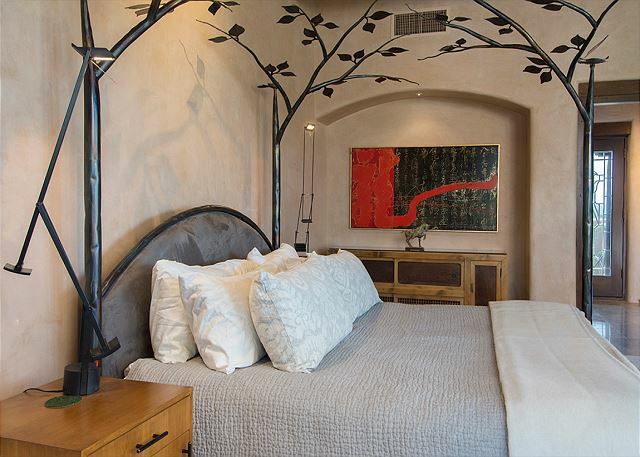 All bedrooms are en-suite with walk-in closets and access to private portals with access to well-maintained gardens. 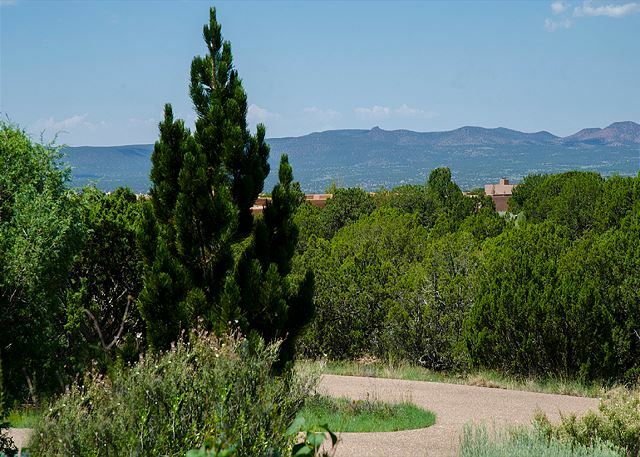 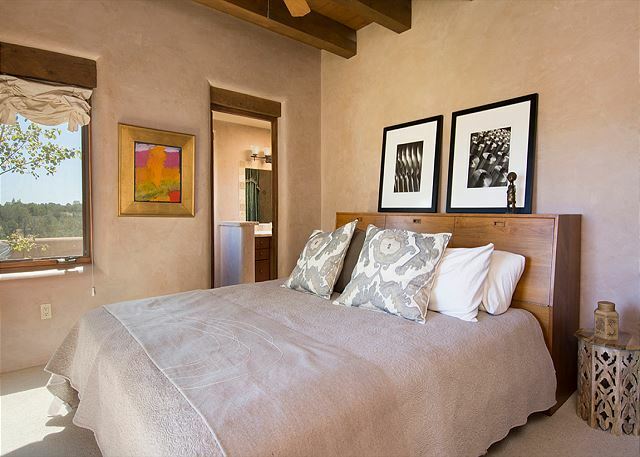 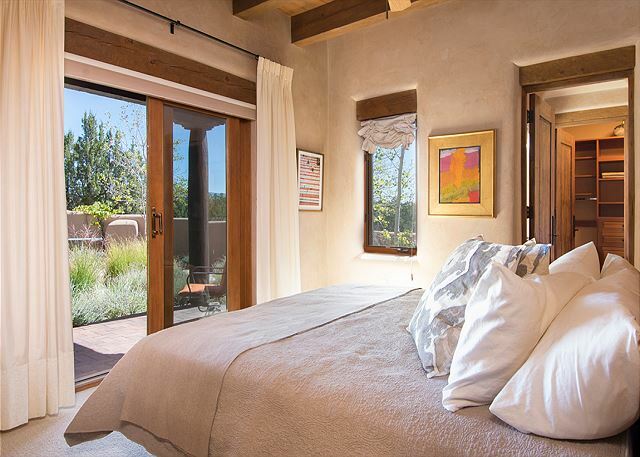 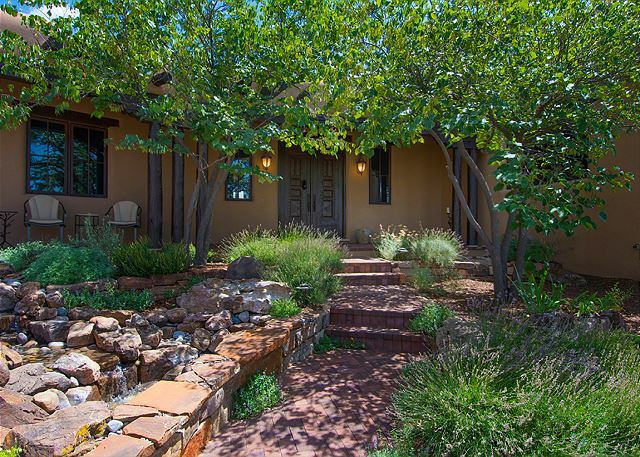 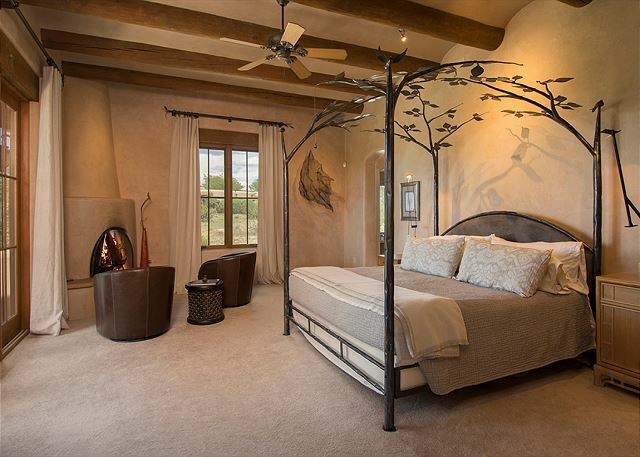 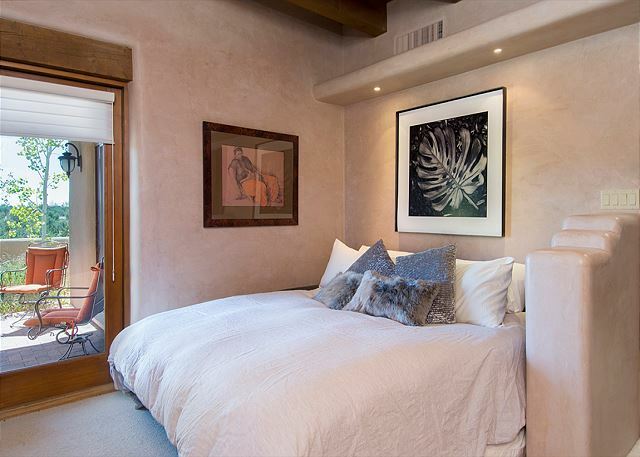 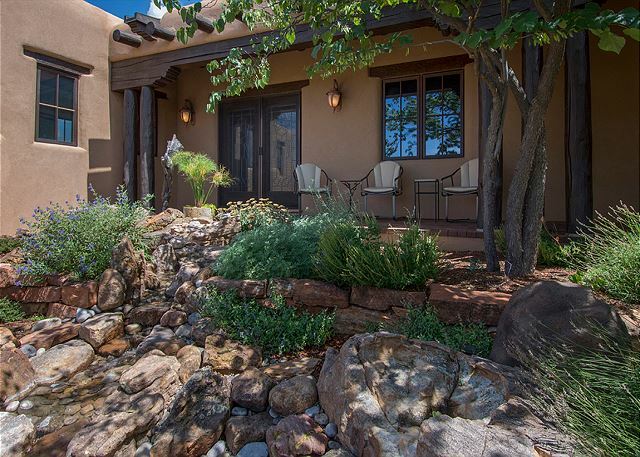 The master bedroom is an inviting suite complete with custom king bed with views into a Japanese inspired Zen garden and onward to the Jemez mountains. 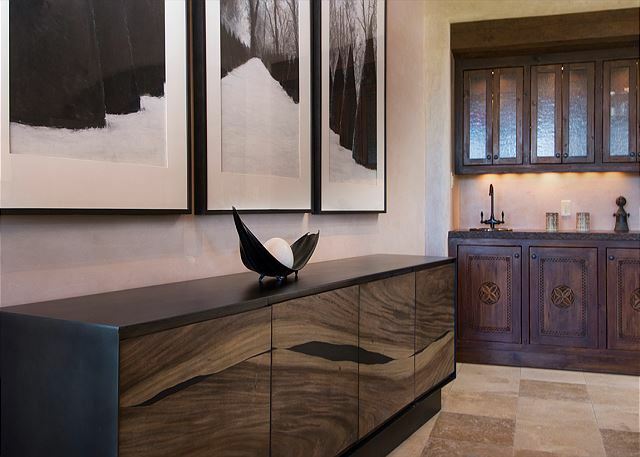 It is furnished with antique Japanese tansu, antique Chinese chest. 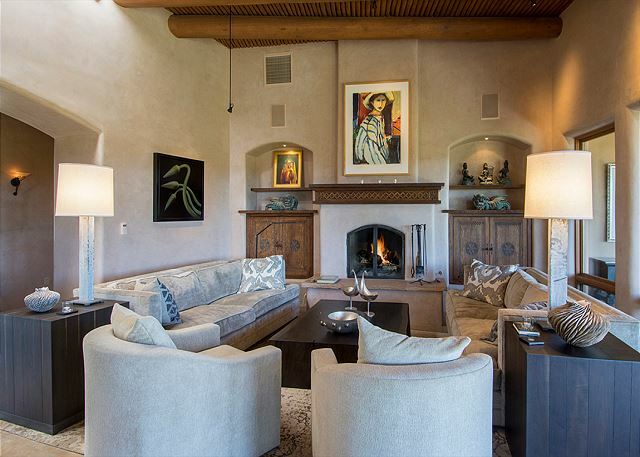 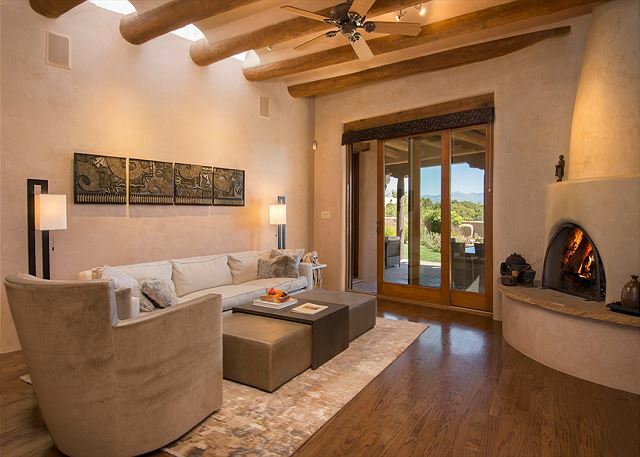 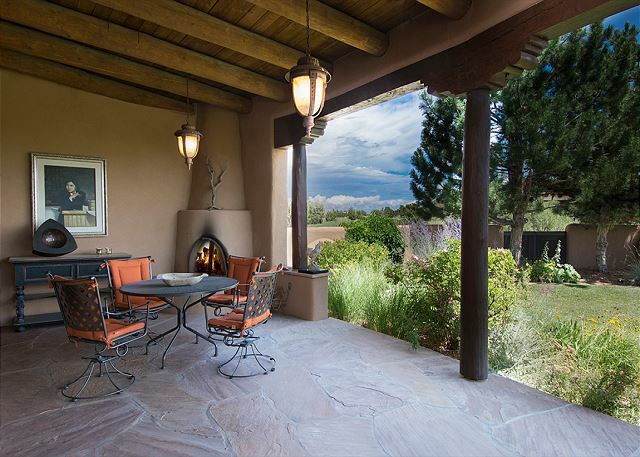 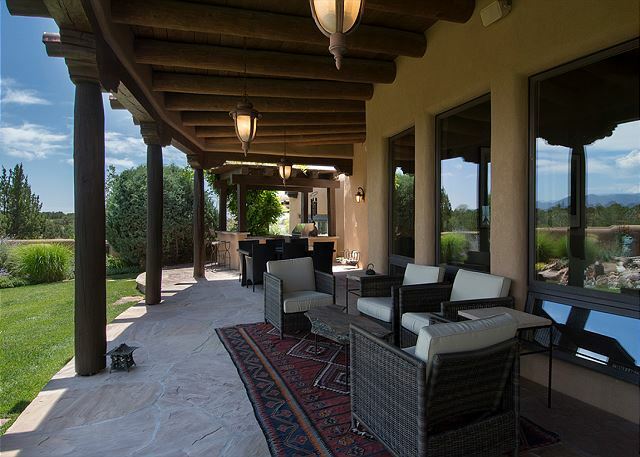 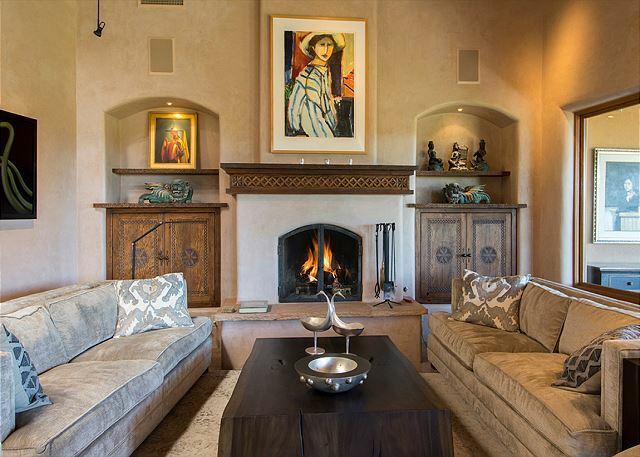 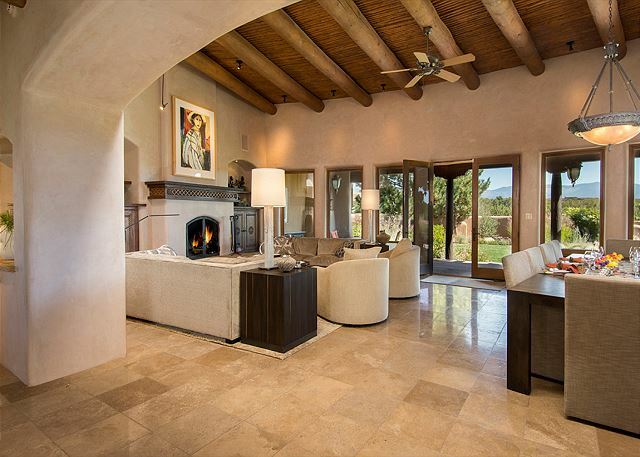 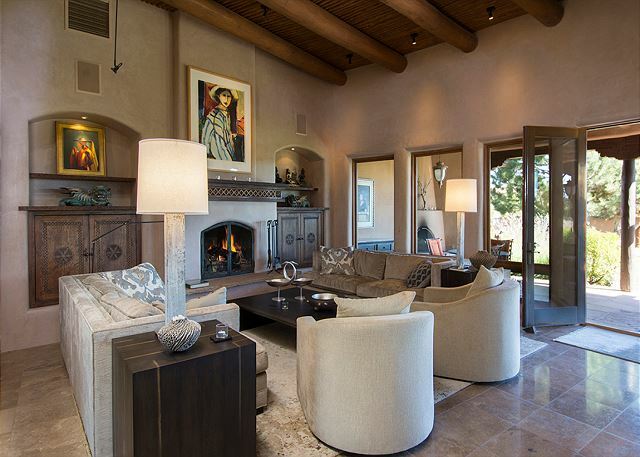 At the gas assisted kiva fireplace, relax with morning coffee in comfortable leather chairs. 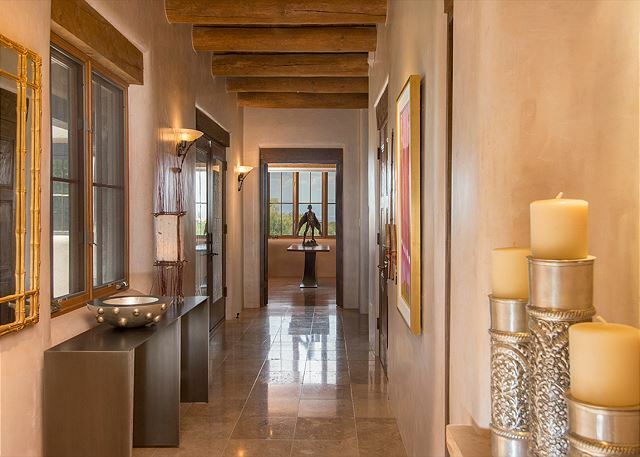 A skylit vestibule leads to a large walk-in closet and the master bath. 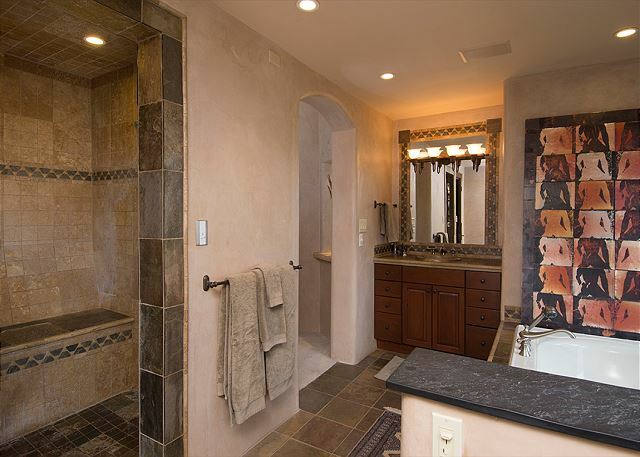 The steamer/shower has 2 separate shower heads, one wall mounted, the other an overhead rain shower. 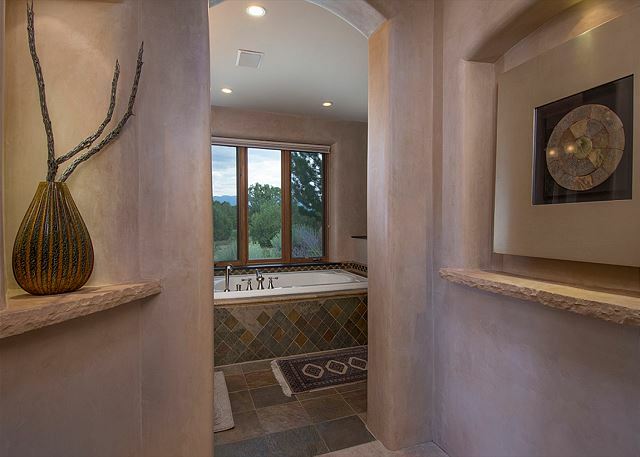 On chilly winter days warm your bones in the steam as you sit on the large tile bench. 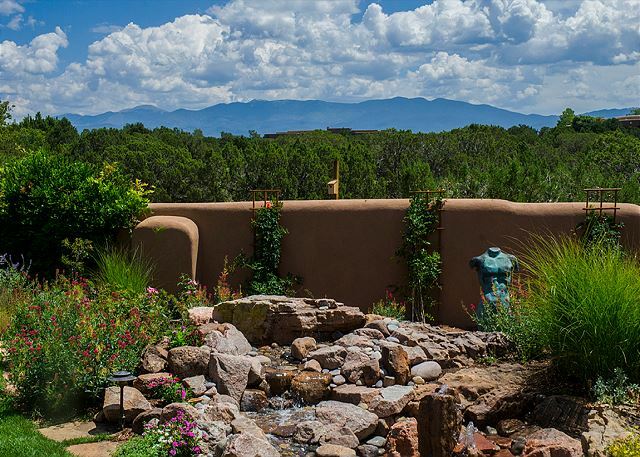 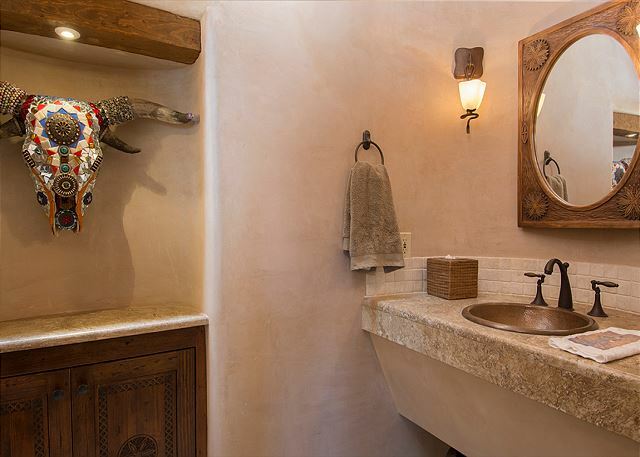 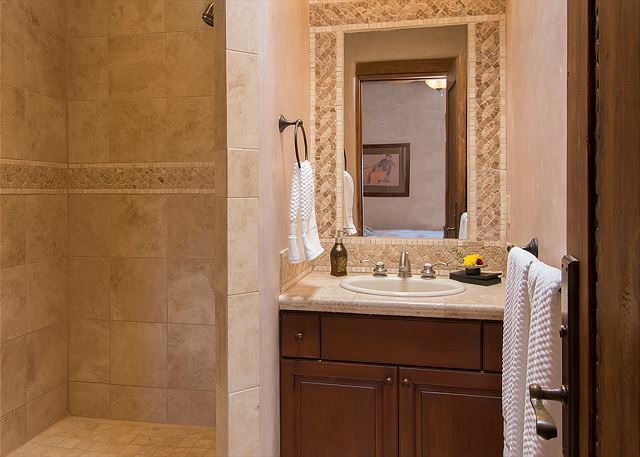 A large soaking Jacuzzi tub offers piñon framed views to the Sangre Mountains. 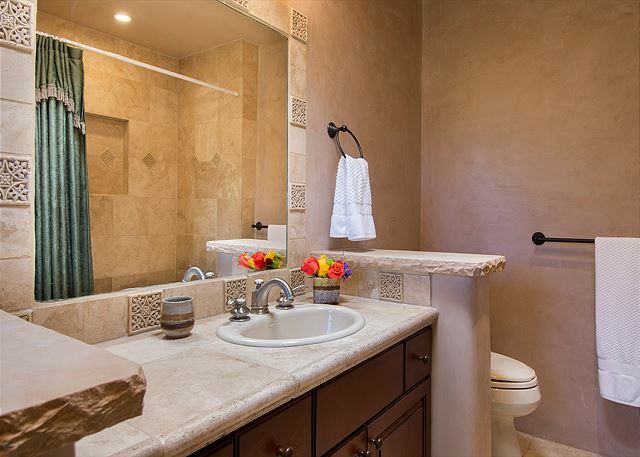 The toilet is a new Kohler Japanese inspired spa fixture. 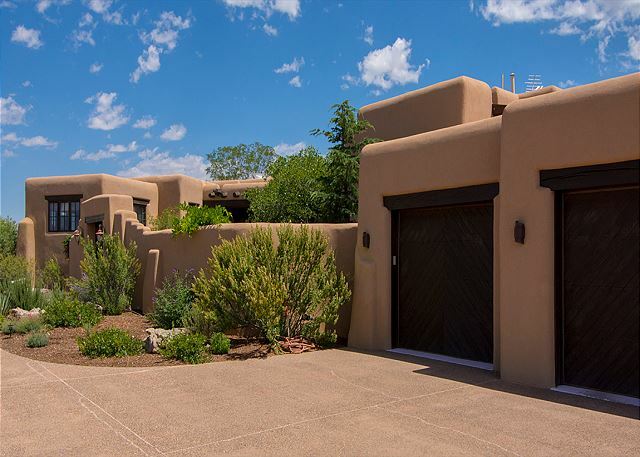 From the long concrete paved driveway leading to a three-car garage, you have easy drive-in access which is close to the kitchen for a no effort carrying of supplies. 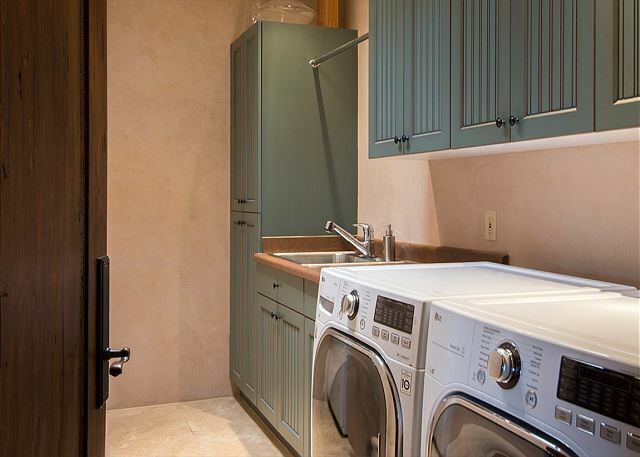 The spacious laundry room has new top of the line washer and dryer and a separate hanging rack for drying delicate clothes. 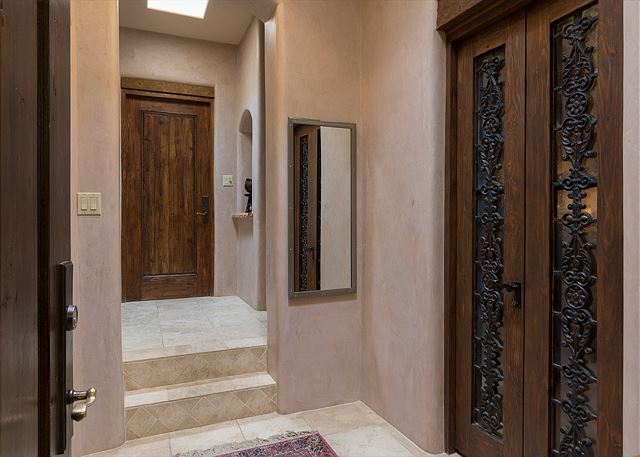 At the end of the Mount Chacoma focused hallway is a media room with a large smart TV including surround sound. 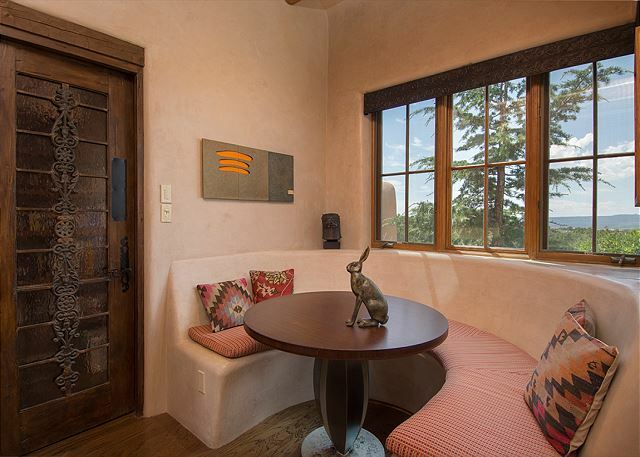 The room is also equipped with a subzero mini fridge tucked behind beautifully carved doors. 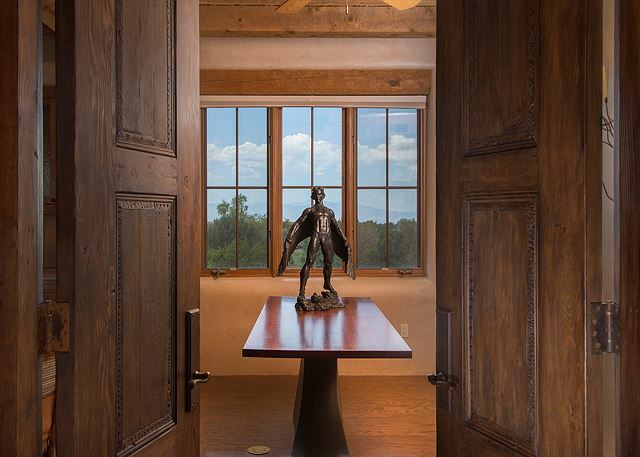 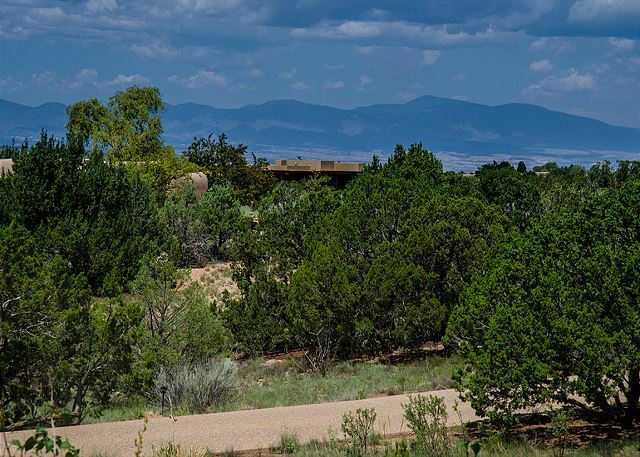 Adjacent to the media room is a private office surrounded by windows giving full-on views to the Jemez, Ortiz, and Sangre mountain ranges. 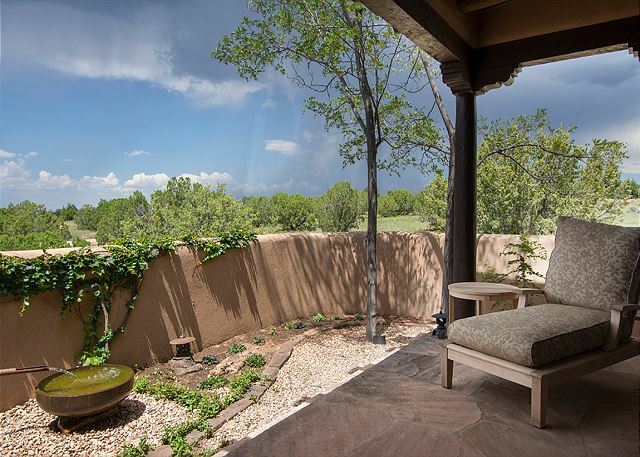 8 Painted Horse is indeed a peaceful, lovely, and welcoming retreat from a busy noisy world.